Mobike and Ofo are the two biggest start-ups in the sector, and they are burning through investors’ cash in order to become the “Amazon” of bike-share schemes. As Velo Mondial predictie last week during the Bike+ Conference in Manchester and Bloomberg now reporting: Investors in both companies – which would have a combined value of $4bn – have been holding pre-merger talks. The companies are separately backed by China’s two biggest e-commerce giants – Alibaba and Tencent. 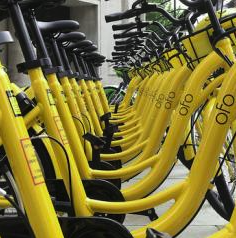 Tech companies like bike share companies not just because of mobility but also because of data-mining. The bikes are used by smartphone-wielding millennials. That’s one of the conclusions in a market report on the relatively new sector. “What attracts investors is the integration of rental services with the Internet or mobile Internet, such as GPS and mobile payment,” stated the report, blandly.